Have you ever wondered why your approach to discipline doesn't seem to be "working"? Oftentimes it's a matter of consistency, but it could also be that your discipline is missing something; perhaps it's not truly connecting to your child's heart. A biblical picture of the heart includes a child’s mind, will, and emotions. In our role as parents, we are charged with training our children in all three of these areas so that they will grow up to be committed to Christ. Anytime your children have a problem or issue, it is going to fall into one or more of these three categories. If we learn to look at each situation in this way, we will be able to apply the proper method for training them that takes that particular area into account. If we appeal to their emotions when their thinking is confused, we will not make much headway. They may be feeling just fine while they are consumed by selfish thoughts! 1. The first area, the mind, deals with what they know or do not know. Sometimes children misbehave because they do not understand the right way. So if that is the issue, then we deal with their mind and teach them what they need to understand. Training our children in the area of the mind means we are replacing ignorance or lack of knowledge with truthful teaching. 2. The next area, the will deals with their choice to obey or rebel. It means that they know what they should do and are doing it, or they know what they should do but they will not do it. Training the will involves a process of ongoing admonition, exhortation, and teachable moments – following up on their willful actions with correction and discipline where appropriate. Although character qualities, such as procrastination, are not addressed (for the most part) by physical discipline, character weaknesses can become willful and then require discipline. 3. The last area, emotion, deals with how they are handling a situation. They know what to do but they are discouraged or fearful. Their emotions can make them question what they know they should do in a situation. In this area we are replacing discouragement with encouragement. This child needs to have his heart refocused to trust in the Lord. 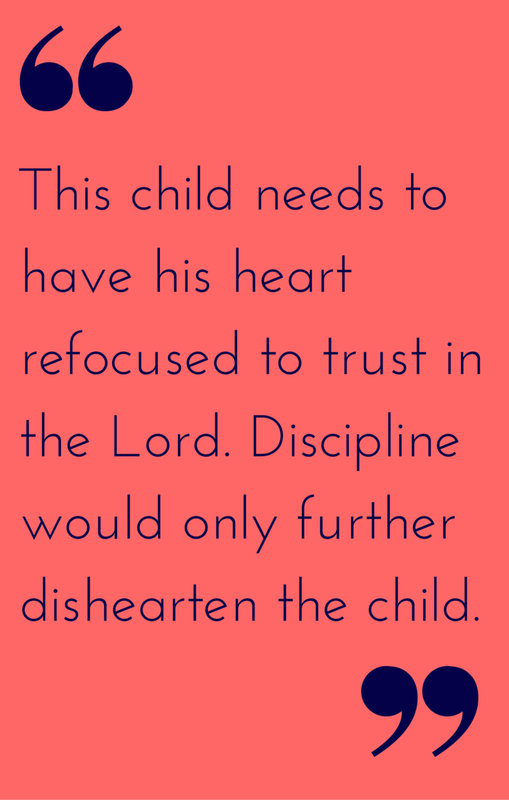 Discipline would only further dishearten the child. As you can see, we cannot ignore mind, will, and emotion in our daily interactions with our children. Basing our responses and actions on their “heart” status will immediately make a difference in how we train and discipline our children. For more thoughts on discipline, see Dear Betsy, How Should I Discipline? Posted on April 6, 2016 by Betsy Corning and filed under Building Your Family and tagged betsy's tips discipline. The following two questions are similar in reflecting the discouragement we can often feel as parents. Though the details vary somewhat, the principles are similar and so I thought I would address them together. I am a home school mom who is having a difficult time with obedience. My oldest son is 10 and has always had a hard time with self-control. He is pretty wild although he has calmed quite a bit as he has gotten older. He has a bad attitude about helping with chores (everyday) and they are often not done correctly. He seems to have a new attitude of not caring so much about correction. My husband doesn't discipline. We both end up screaming and yelling but ultimately no real punishment is given because we feel bad for losing our tempers. I want to train my children to do right the first time, right away, and with a happy heart…but I am failing. I feel so overwhelmed and I fear it is too late for my family as I see my 5-year-old and 3-year-old picking up the same behavior. I am unsure if I should be super-stern or super-forgiving. I can't find a balance that works. There is so much written about how to train a toddler but what about those of us who are trying to fix what we failed to do earlier? I feel as though I need the “super nanny”....hahaha. I am only laughing though if you don't offer that; if you do, hurry! What advice and tangible ideas do you have on finding balance and setting limits for starting late??? What hope can you offer parents who have teenagers and who feel like they have blown it? What hope can you offer moms or dads who feel like they are parenting alone even when there is another parent in the home? As children grow, they may buck the system and begin to take Mom for granted or “tune her out." They may develop attitudes that are dismissive, disrespectful, and disobedient. Undermining, manipulative tactics of selfish behavior meant to throw Mom completely off course will likely soon follow. Most every mother at times feels as if she has “blown it," failed, that her training is ineffective, or that she has “doomed her child to life on the dark side.” I certainly have felt this way at times. But children also have a responsibility for their own growth and this responsibility increases as they mature. Be encouraged just knowing that this is a common concern among mothers. The Lord is with you in this process, even if your spouse is not. And if your child has come to saving faith in Christ, then the Lord promises to work in him or her and bring forth sanctifying fruit in His timing. Of course, there are still years of faithful training required on our part! It is imperative that you build a tender connection with your child — one that takes the necessary time to establish, and that will guide them throughout their lives. You will want to take special care to guard this connection through the rough and tumble teenage years. Spend time together — just the two of you — for at least several minutes a day, and whenever possible eat dinner as a family to keep the lines of communication open. Have special things (they may be very simple things) that you look forward to doing together. Work as a team on things that give them a sense of growth, accomplishment, respect, increased responsibility, increased privilege, opportunities to help to others, and so forth. Entrusted with a Child’s Heart offers a diagram (see below) that helps to clarify this training process. It shows that as your child matures, your role as parent will gradually change. Your child will become more and more responsible for his or her own actions and you will be watching for the desired outcomes (in the bottom row). The first column (with the heading, AUTHORITY) generally applies to the ages of 0-5, the next (TRAINING/CORRECTION) comes in around the ages of 6-12, and the third column (GUIDANCE) covers the teen years. During their adult years, you will maintain a close connection but the roles and outcomes change considerably. This is the time when you truly reap what you have sown. As children are maturing, they will “test the anchors” of your training. We, as parents, must be watchful, careful and prayerful to stay the course and to keep that relational connection. If we are trying to control their outward behavior only, we will lose their heart and that important connection in the process. As parents we have been entrusted with the task of moving the hearts of our children from a state of self-centeredness toward one of God-centeredness. We want to build a lifelong loving connection but at times we can't be their "best buddy" because we have a responsibility to faithfully train them and establish limits in their lives. However a close loving connection will hopefully endure as they mature and roles change. Often parents get so caught up in the external behavior that they lose the internal connection with the child's heart, the child pulls away and becomes unresponsive or disrespectful, and the connection is lost. Do not be overly discouraged, but recognize and handle manipulation. (The self-centeredness that is erupting will erode your relationship if not addressed.) When these situations arise, step back and assess it without diving into the heat of the moment. After you have determined a plan of action, address it with your child/teen. Have a calm but firm discussion about your assessment and be willing to listen and hear them out. It may be that some repentance and forgiveness needs to take place to mend the relationship, or maybe they simply need a renewed understanding of your expectations. Remember, as they are getting older, we are easing up on some authority and giving them leeway to learn from their choices. I Samuel 12:23 offers encouraging instruction for parents, “Moreover, as for me, far be it from me that I should sin against the Lord by ceasing to pray for you; but I will instruct you in the good and right way.” The Lord continues His sanctifying work in our kids—and in us! Isn’t it great to know that we do not have to make sure they are "perfect”? Phew! This was a long answer! There is so much here to ponder, pray over, and put into action. Let’s pray together for strength! I pray for these mothers whose hearts are burdened. Please grant them a sense of Your nearness, and a good measure of Your grace to patiently parent their children with a proper balance of love, limits and perseverance, knowing that their work is not in vain. I would even ask that You would greatly encourage their hearts today by revealing “buds” of the fruit yet to come through their labors. Help us all as mothers (parents) to be committed to the parenting process to which we are called, knowing that the true sanctifying work is accomplished and completed by You. We thank you for the sweet privilege to invest in the lives of our children. Please equip us to capture their hearts and captivate them with the wonder and blessing of living for You. Amen. Posted on January 27, 2016 by Betsy Corning and filed under Building Your Family and tagged discipline encouragement. When I began my student-teaching experience, my cooperating teachers began the year by introducing the procedures. Each day they would introduce several operations, and then they would model the appropriate behavior, an example or two of inappropriate behavior, and then call on a few student volunteers to attempt the procedure correctly. It worked. It worked really well. Often children seem disobedient, but they really just need a clear understanding of the expectations. When I was given my own classroom, I adopted the same training method. Occasionally we would revisit the modeling of a procedure, but for the most part, the tasks we had modeled thoroughly were performed successfully by the students. (Deut 30:15-16) God wants us to succeed, and He tells us how! Let’s provide our children with tools for success too! Think about a typical meal time. How many behaviors are you telling your kids not to do? Are you and your husband constantly trying to get your kids to act appropriately at the table? Perhaps you already have a great system going. If not, the next opportunity you have, decide on your top 3 rules for meal time (for older children, you could try 5 if needed). Introduce them to your children. First, model the incorrect behavior. Be silly and have fun with it! Talk about the problems of the behavior. What would it mean for your family if everyone acted that way? Next ask them to model the incorrect behavior. Let them ham it up, and laugh with them. Finally, model the correct behavior and ask your children to do the same. Talk about the benefits of following the rules. For example, “If we all follow Rule 3, everyone gets an opportunity to talk about their day.” Hopefully you can get to a point in which you refer to the rule and the child corrects it. Then you can spend your time together having a positive interaction, rather than a rebuking session. How about before you go to a play date? My son and I practiced this today. He had a few friends coming over. They’ve barely played together, and one of the children is much more reserved than Lincoln. We talked about how to make the time fun for the friends. We decided on two rules: 1. Be kind and use your friendly face. 2. Share all of your toys. Lincoln added “Be respectful.” He had some examples of what that looked like, and I wanted to encourage his input, so we threw that one in too. I wanted to keep it really simple so he could remember them. When I drop my son off at his new homeschool co-op classes, I say, “Be kind. Be respectful. Be a blessing.” There are lots of modeling opportunities for this one. From what I’ve seen, I may need to add in “Use your inside voice,” and model that one a bit! How about proper worship and prayer behavior? Store rules? Interruption rules? Doctor visit rules? You can, and should, model the expectations you have for your children often to set them up for success. This may sound like a tip that is only for young children, but I think it is valuable for the toddler age through pre-teens. Laura recently video-taped her children role-playing the first day of school. Her daughter began by being very shy. When Laura played the video back, her daughter was able to see the timidity in a new light. She realized she was not friendly and it was not the persona she wanted to put forth. They role-played the activity again, and a new girl, bursting with courage and joy was captured! Consider taping your children so they can see themselves. At a conference I recently attended, a mom of 14 shared about a family game she and her husband created. They basically play “Charades” with different scenarios the children may encounter. For example, “You are at a friend’s house and you are asked to watch a movie you know Mom and Dad would not allow. What do you do?” The kids then act out the situation and the solution they’ve decided upon. Will this solve all of your children’s sin issues? No, but it will let them know how they should respond if the situation occurred. Lets strive to "admonish the idle, encourage the fainthearted, help the weak, be patient with them all." Posted on September 30, 2015 by Stephanie Hickox and filed under Building Your Family and tagged discipline. If you read last week’s post, you know I am no stranger to having my children say hurtful things. Children often choose cruel words to manipulate a situation or because they haven’t learned how to restrain their frustration, sadness, or helplessness. We can have many, many talks with our children on how and why to control our words. Ironically, when we have these talks about their powerful words, our words often fall flat. An object lesson can be a helpful tool to teach, especially to young children. Hands-down, the best object lesson I have ever seen was taught by my former Headmaster. She was teaching a chapel lesson. She gave a tube of toothpaste to each of four volunteers. They were given one minute to squeeze as much as they could onto a plate. When the minute was over, they were given another minute to get the toothpaste back into the tube. We watched them struggle strategically. Of course, they all failed miserably, but it was entertaining to watch! The students walked back to their seats to find out how this was going to tie into a lesson. The Headmaster explained that once our words leave our mouths, we can never get them back. I thought of this lesson recently and realized it may be a good time to show it to my son. (Sidenote: I purchased Dollar Tree toothpaste!) I decided to do it with him in an individual setting (because my two year old and my one year old would only do damage with this experiment!). You can see the bewildered look on Lincoln’s face when I asked him to put the toothpaste back in the tube! Did fireworks go off when I explained the lesson to him? No, but the next time I see him searching his mental rolodex for hurtful words, I will refer to the toothpaste lesson. And the next time. And the next time. For as long as it takes. You see, Jesus told us that the mouth speaks what is in the heart. (Luke 6:45) Words are a heart issue. I don’t just want my kids to learn to be robots, avoiding the words that get them into trouble. I want their hearts transformed too. However, if we can get our children to submit to the Holy Spirit to help them in guarding their tongues, we are equipping them for holiness in other areas. 1. Luke 6:45 The good person out of the good treasure of his heart produces good, and the evil person out of his evil treasure produces evil, for out of the abundance of the heart his mouth speaks. 2. Proverbs 18:21 Death and life are in the power of the tongue, and those who love it will eat its fruits. 3. Proverbs 10:19 When words are many, transgression is not lacking, but whoever restrains his lips is prudent. 4. James 3:5-12 So also the tongue is a small member, yet it boasts of great things. How great a forest is set ablaze by such a small fire! And the tongue is a fire, a world of unrighteousness. The tongue is set among our members, staining the whole body, setting on fire the entire course of life, and set on fire by hell. For every kind of beast and bird, of reptile and sea creature, can be tamed and has been tamed by mankind, but no human being can tame the tongue. It is a restless evil, full of deadly poison. With it we bless our Lord and Father, and with it we curse people who are made in the likeness of God. From the same mouth come blessing and cursing. My brothers, these things ought not to be so. Does a spring pour forth from the same opening both fresh and saltwater? Can a fig tree, my brothers, bear olives, or a grapevine produce figs? Neither can a salt pond yield fresh water. 5. Galatians 5:16-25 So I say, live by the Spirit, and you will not gratify the desires of the sinful nature. For the sinful nature desires what is contrary to the Spirit, and the Spirit what is contrary to the sinful nature. They are in conflict with each other, so that you do not do what you want. But if you are led by the Spirit, you are not under law. The acts of the sinful nature are obvious: sexual immorality, impurity and debauchery; idolatry and witchcraft; hatred, discord, jealousy, fits of rage, selfish ambition, dissensions, factions and envy; drunkenness, orgies, and the like. I warn you, as I did before, that those who live like this will not inherit the kingdom of God. But the fruit of the Spirit is love, joy, peace, patience, kindness, goodness, faithfulness, gentleness and self-control. Against such things there is no law. Those who belong to Christ Jesus have crucified the sinful nature with its passions and desires. Since we live by the Spirit, let us keep in step with the Spirit. 6. Ephesians 4:29-32 Let no corrupting talk come out of your mouths, but only such as is good for building up, as fits the occasion, that it may give grace to those who hear. And do not grieve the Holy Spirit of God, by whom you were sealed for the day of redemption. Let all bitterness and wrath and anger and clamor and slander be put away from you, along with all malice. Be kind to one another, tenderhearted, forgiving one another, as God in Christ forgave you. Another fun lesson idea for older children: Print out a few chapters from Proverbs (Chapters 10-19 are especially great ones). Have them highlight each verse that pertains to the tongue. They may be surprised how often God’s Word refers to our speech! I would be remiss if I didn’t point out this next fact: You can teach your children this lesson every day, but if you are not modeling it, you are doing more harm than good. Ask the Holy Spirit to give you the power to emanate his love, self-control, and kindness. Posted on September 16, 2015 by Stephanie Hickox and filed under Building Your Family and tagged teaching faith to kids discipline. “I wish you weren’t my mom. I wish you were dead!” My jaw dropped in horror--how was he capable of saying such a thing at three years old? Where did he even hear those words? I quickly prayed about how I should respond. Immediately I knew it was okay to let my tear-filled eyes spill over. “Go ahead. Let him see how he hurt you,” was the impression of wisdom I felt. It was Thanksgiving, and I had just denied Lincoln his request for a cookie. We had shared a piece of pie, and I had told him it would be our only dessert. Then his great grandma offered him cookies and I said no. He began to throw a full-on tantrum in the middle of the entire extended family. I calmly picked him up and ushered him to the nearest closet to discuss the issue privately. Once there, he spat those horrible words at me. To onlooking relatives, it seemed like a tiny issue to go to war over. However, I knew it was yet another battle with my strong-willed firstborn. He needed to know I would keep my word. Screaming and kicking would not--could not--warrant his success. We had a long talk trying to get at the heart of the issue, but he seemed unrepentant and headstrong as ever. He issued words of apology, but they were flat and out of obligation. The previous Easter, I sat on my friend’s couch nursing my newborn, watching my one-year old play, as Lincoln opened the front door and ran out of the house toward the street--against my directions and stern voice, of course. I unlatched my baby, and began chasing after my stubborn toddler. I disciplined him. We went full circle. He was unrepentant...again. He even tried to escape the house again. We repeated the exercise, but I wasn’t seeing any fruit. When it was time to go, I carried him out of the house while he was screaming at the top of his lungs. He was also a bear to the other children that day. The few weeks after I had our third son, Lincoln gave me such a run for my money. He knew being consistent was going to be a challenge while I was healing and caring for an infant, and he went to war on me. The strong will we began to see at nine months was in full force now. I tried to give him as much affection and love as possible because I knew he was going through a huge transition, but his behavior went beyond excuse. He was calculating and manipulating. Even one of his loving grandmas quipped, “Makes you understand how some people can beat their children, doesn’t it? !” I began to wonder how I was going to raise my three little boys with any semblance of consistency--or productivity--with this willful one challenging me every waking moment. I worried that God had allowed them to be closer in age than I could handle. I felt like I was in over my head in a role I wanted to succeed at desperately. Each passing day made me realize more and more that these children were souls… representing an eternity. I longed for each of them to choose life, but I was realizing more and more how little control I had over that choice. These are just a few of the examples of the battles I’ve had with Lincoln. When we first had him I can remember gazing at him with my husband, delighting in each one of his expressive faces. He brought us so much joy. Once we looked at each other and said, “I know what everyone says--that someday there will be times he will be disrespectful and disobey us, but I can’t picture that happening, can you? I know he will, it’s just so hard to imagine!” We were so naive. I know. When you look at those precious newborn cheeks, and those sweet fingers clasping onto yours, it is hard to picture that child being capable of evil. The world says we are born innocent, and we learn to do wrong. (How they think evil gets introduced with everyone being born innocent, I have never understood.) The Bible says we are born sinful. With submission to Christ we overcome our sinful natures. The world offers defeat. The Word offers hope. I knew this truth up and down, and absolutely believed it. But recently I was convicted that I was believing the world’s lie. When my son would disobey (and all of the disciplining seemed to have no effect) the whisper in my ear, “If he’s capable of doing this at 3, what will he be like at 17?” confirmed there was a gap between my head and my heart. I was taking part in this lie and it was causing me to despair. I wonder how many mothers are struggling with this very thing. If you are looking down the road at your child and losing hope, you are not viewing the future biblically. I’m not condemning you--I get it. The fight to hope is hard. That’s why it’s called the good fight of faith (1 Tim 6:12)! But we must believe God to be mighty in our most precious treasure--our children. If we don’t we will despair, and the necessity of consistent discipline will make us grow weary. The hope is what makes us press on. You see, Psalm 27:13-14 (NASB) says, “I would have despaired unless I had believed that I would see the goodness of the Lord in the land of the living. Wait for the Lord; Be strong and let your heart take courage; Yes, wait for the Lord.” Our God is the God of the Promise. Our God is the God of the Impossible. Our God is Faithful. Are you seeing your child through the view of His Mighty Hand? This word of encouragement is also a challenge: We must be diligent with each of our children. Even my mild-tempered, obedient two year old has a self-serving will. I need to guide him in overcoming his sinful nature as faithfully as I am trying to help Lincoln. Our children may rebel, but let it be because they chose it, not because we haven’t faithfully done our parts. Honestly, it’s a little hard for me to put these words out into the blogosphere. Lincoln has brought me so much joy; I don’t want to focus on the negative. However, I want to be real and offer hope to other moms. Honestly, now I am exposing these words without any fear. One day he will read these words and we will laugh because they are far from who he has become. Just recently, I am finally seeing the fruit of our discipline. This week, I overheard Lincoln helping his frustrated two-year-old brother do a puzzle, “Ryder, rejoice in the Lord always! Can you try this piece? Here you go. Yay, Ryder! I knew you could do it! Good job!” He consistently encourages and protects his brothers. He is getting his passion more in check every day. He yells out almost hourly, “Hey Mom, I love you!” He picked me several flowers from our garden yesterday and told me, “I did it because I love you, and I want to make you happy.” His heart now desires to bless others, not just serve himself. Thank you, Jesus! If you could test drive children like you test drive cars, I may have said, “This model looks great, but can I have something with a lot less horsepower?” But you can’t. And now I can wholeheartedly say I rejoice in that fact. God gave this young man to me. This strong-willed little boy taught himself to read at three. He potty-trained in a flash right at two. When I said it’s time to throw your pacifiers in the trash, he whipped them in without looking back. When he decided to ask Jesus into his heart, he insisted on leading the prayer. He will be a history-changer. And I have a front-row seat to this transformation. To God be the glory! Will you join me and “laugh at the days to come” with your entrusted ones (Pr. 31:25)? Posted on September 9, 2015 by Stephanie Hickox and filed under Building Your Family and tagged betsy's tips discipline. Dear Betsy, How Should I Discipline? My oldest is 3 years old and she is very smart and has great language and communication skills. She also is very independent and usually wants to make her own plan or modify every directive I give or she will say, "I don't want to." Am I to spank for every incident of defying me throughout our day? Or should I try reasoning with her first? Do I just pick a few? Is only picking a few not being consistent? I don't want to exasperate her, but I would also hope to see a more submissive heart? Really want to know what is appropriate for a 3 year old!!! 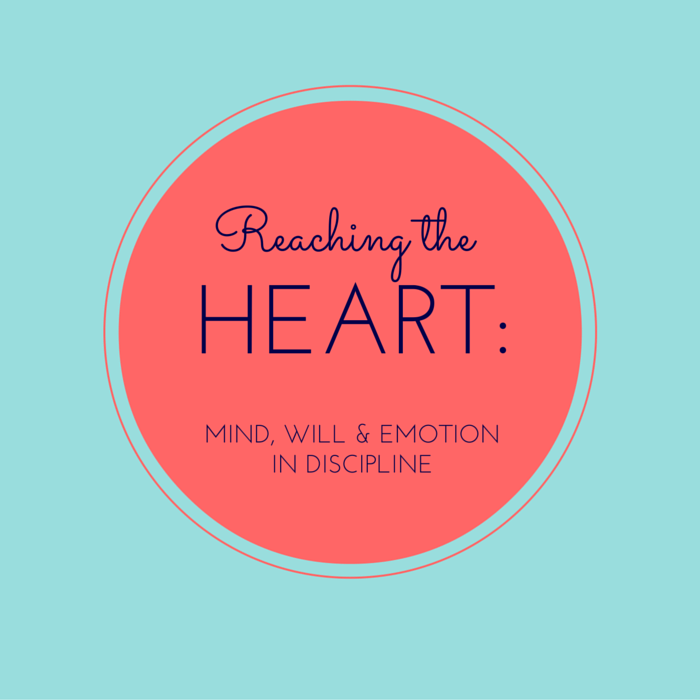 I want to encourage you in your desire to get to the heart of your child’s behavior. Your concern about her resistance to your authority is a valid one. Having said that, I want to stress that this scenario is very common! We know that we cannot actually change the heart of our children—that is the work of the Holy Spirit alone—but we also see that we are commanded in Scripture to train (them) in the way they should go. So the question becomes, what do we do when they don’t respond to our attempts at training in the way we expect (or hope) that they should? It’s easy for a parent to think it should be easier—or quicker—than it turns out to be. As we are training our children, we learn so much about patience, perseverance and the reality of the sin nature in all of us. Understanding and accepting that this will be a process has been very helpful for me. How long will the process be? This depends on a lot of factors such as: their temperament, their age, your consistency, and ultimately, their will. I like to remind parents to always be watchful, seeing the “direction” the child is heading, and quickly re-direct them. Sometimes this is a physical act of picking up that baby that’s headed for the outlet and saying, “No-no,” over and over again. Other times it’s actually taking them through the full-circle of discipline (with or without a spanking). But make no mistake about it, it will at times seem to wear you out...but be encouraged! 2. Be sure you and your child have an agreed understanding on what it means to obey, as in “all the way, right away and with a good attitude (or a happy heart)” or however you choose to say it. The point is that they understand that obeying when they feel like it or with a rebellious spirit is not true obedience. 3. Try training (or retraining if you’ve gotten away from being consistent) when there isn’t a current conflict. You can make it a game or role playing activity. You might say to the child, “Okay, Mommy’s going to tell you to do something and I want you to practice what it means to obey.” You might even let them pretend to be the mommy and you can model both obedience and disobedience and see if they “get it.” This can open the door to a conversation about the importance of your role in their lives and that God has given parents for their protection, etc. Making it a little bit fun, outside the context of an emotionally charged conflict can really change the dynamic. Then later when they do begin to argue, or aren’t responding with a submissive heart, you can refer back to your discussion or role play activity. 4. You mentioned not wanting to exasperate her, but the truth is, children become exasperated when parents are not consistent in their expectations and discipline. This is one of the reasons why it is so important to be focused until the habit is broken and the attitude is changed. Children know instinctively that they should not be in charge (even if they say otherwise!) so it is up to us to continually remind them of that truth. 5. It will be very helpful if your husband (and any other caregivers) reinforce this, especially during the initial, intense training period. You are the parent and they must obey you. Their desire to have their own way is a normal part of the sinful nature. It will be a process and you will want to give up at times and say, Is it really that important?? Parents are the restrainers of their children until they learn that their will must be submitted to the Holy Spirit. Therefore, while we always present the grace of the gospel throughout life, it is balanced with training the child to submit now to the authority of their parents. Always, always, always, strive to maintain that special connection with your child—by means of edifying words and lots of affection. Hang in there, Mom! You are definitely not alone. Posted on July 27, 2015 by Betsy Corning and filed under Building Your Family and tagged discipline betsy's tips.